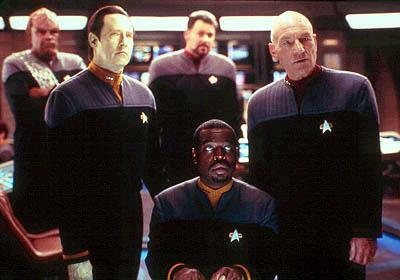 Star Trek: Nemesis is the tenth film in the Star Trek franchise and the fourth for the crew of the Next Generation. Things are floundering for the franchise, which seems to be content to tread water rather than to take a creative step forward (or even backward). Nemesis just is; it's isn't good or bad. It is a great film for Trekkers, and one that non-fans can watch but not salivate over. The main disadvantage with films like this is that they want to appeal to fans, so everybody makes their token appearance, but there is little chance for much meaningful screen time or character development, unlike a television series, which can focus on somebody different each episode. The main star here (well, always) is Patrick Stewart (Jimmy Neutron: Boy Genius, X-Men) as the venerable Jean-Luc Picard, Captain of the starship Enterprise. After presiding the long-awaited wedding for his first officer William Riker (Jonathan Frakes, Star Trek: Insurrection, Trekkies) and ship counselor Deanna Troi (Marina Sirtis, Heist, Paradise Lost), the crew of the Enterprise is called to the edge of the Romulan Neutral Zone. There has been a shakeup in the Romulan government, resulting in the elevation of Shinzon (Tom Hardy, Black Hawk Down, The Reckoning). Shinzon is Reman, a sister-race of the Romulans who live in the dark and have costumes makeup inspired from Nosferatu. Shinzon is making appeals for peace, yet everybody is wary. He also is bald, has a prominent nose, and an English accent, suspiciously like Picard. He claims to be a clone of Picard, one that grew up on the planet of Remus. Star Trek always has used futuristic issues to mirror today's moral dilemmas, and Nemesis plays on duality and the issue of nature vs. nurture. It happens here, but feels forced and handled clumsily. 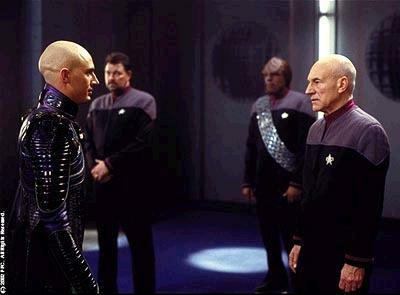 Picard and Shinzon are two completely different people, but, if things were different, would they be the same? The crew also discovers an earlier prototype of Data (Brent Spiner, The Master of Disguise, I Am Sam), which calls itself B-4. Spiner co-wrote the screenplay with John Logan (The Time Machine, Gladiator) and Rick Berman (Star Trek: Insurrection, Star Trek: First Contact), while Stuart Baird (US Marshals, Executive Decision). The tone is a little campier than before, and this doesn't really help matters. It also feels like the filmmakers wanted to appease all sorts of Trek fans by throwing in references and characters from some of the other shows, maybe for fun, maybe because there was nothing better to do. There is lots of action and lots of special effects, but it all feels oh so hollow and lifeless. As always, Stewart has a commanding presence. Hardy is a good opponent to Stewart, although sometimes he is nothing but sneer. Most of the rest of the crew does not register with the audience. Star Trek: Nemesis is a serviceable science fiction movie, but does nothing to take the extra step to make it memorable or worthwhile. 1 hour, 56 minutes, Rated PG-13 for sci-fi action violence and peril and a scene of sexual content.